Haste makes for slow reading, writing and Mathematics progress: Relaxed, steady focus works. One new different thing reading, writing, Mathematics skills at a time. I often only begin coaching one area (reading, writing, or Mathematics) that a student finds difficult, and one reading, writing, or Mathematics skill they are comfortable with, and love. To begin working comfortably with them – begin to build a comfortable and relaxed coaching relationship – I usually suggest that we work on a reading, writing, or Mathematics skill they like first. The other day I met a new student and we began fairly immediately talking about books we liked. The eleven year old boy was an excellent reader and loved science fantasy. He wasn’t coming to me for coaching on reading at all, but to develop his writing and Mathematics skills. However as we began to talk reader to reader and I offered him some books out of my library and asked him to lend me books he was reading, we naturally progressed to talking about a small science fantasy novel he might write. He actually came to me for coaching to develop his writing skills (spelling content, and sentence structure), and his Mathematics skills which in the first session we only touched on. He walked out with some of my books to read, very excited about the story he’d write, and also hooked into developing his Mathematics skills with me.We bonded well. I believe that he looked forward to working with me on developing his writing and Mathematics skill the following week and I certainly looked forward to working with him again. It is extremely important for the respectful, harmonious coaching relationship you are endeavouring to develop with your child, that while you are actually working with your child so that they will improve their reading, writing, or Mathematics skills, the coaching time should be enjoyable and relaxed (most of the time) for you both. I suggest that you offer your student regular moments of pleasurable achievement and fun. The coaching of new skills is of course hard work most of the time, but the reward of having some pleasant, fun time with you each coaching session will mean that you both will be more likely to keep the coaching going through the hard times when the work is not easy to coach or learn. When you both have regular moments when you have a laugh together, get excited together, enjoy a chat, or both feel very pleased when something is understood or mastered, means your child will keep coaching reading, writing, or Mathematics with you, even when something is hard to learn and definitely isn’t fun. Here is another post with tips on creating a respectful coaching relationship with your child when coaching reading, writing, or Mathematics skills. Check out an excerpt from my coaching guide. Because of all the past good and harmonious coaching times your child will be able to keep focused and learning reading, writing, or Mathematics even when they are not feeling like learning and so will you! 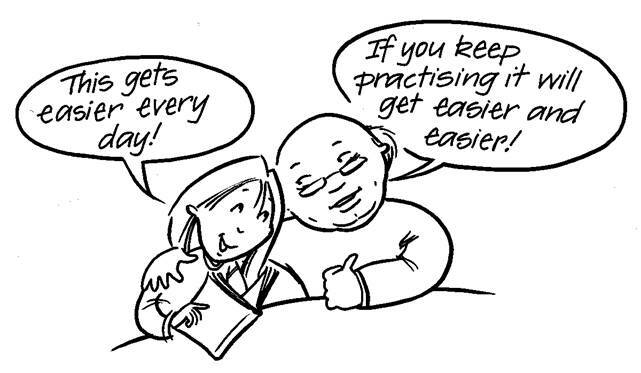 Please share any successes you’ve experienced when coaching your child. Posted by annethecoach on 24 August, 2012 in coaching, reading and writing skills and tagged coaching, helping your children, home schooling, Mathematics, reading, respectful relationships with your child, teaching, writing skills.